A Media Player vs. HTPC – What is Right for You? You might be asking yourself what is going to be the best for you when it comes to a media player or an HTPC. This is certainly a good question to ask before you go out and make a purchase. In order to make this decision it will be very important to understand a little bit about each of them. Then you can make an informed decision and know that you are going to be happy with the end result. First off, have you heard of a streaming device? This is going to attach to your television and they will give you the ability to watch movies or shows that come from your computer or internet sites. If you have used devices like this in the past then you should know that a media player is going to work in approximately the same manner but you will find that they are going to be a little more complicated to set up when you are using it. You are also going to see that when you have a media player you will be able to use it to play videos and such from an internal hard drive and an external as well. But, if you are interested in more features then you may be happy to know that these can be modified with firmware that you can customize. Those individuals that are interested in very technical equipment might want to take a look at an HTPC. This is a Home Theater Personal Computer. Those people that like to put their own operating systems and applications on their computers will love the HTPC because they are going to have the freedom to do this. If you want certain aspects on your HTPC but you are not willing to put these on the device, or you do not want to do the work, then you can always select an HTPC from a company that will do this for you. Then you are going to have whatever you want on your device but you will not have to do the work. While all of this might sound good to you, it is very important to know that you are going to find that it is more complicated to keep the antivirus updated and ready to when you have an HTPC. This can add up financially for you as well. When you think about purchasing a media player you should consider the fact that it is not going to play every file in every format. You will see that a HTPC will be more effective at this. If you are concerned about watching the file in perfect 1080p resolution then you might not want to purchase a media player. On the other hand, you are going to see that you can often purchase a media player for $50.00 but you will see that you could end up paying more than $1,000 for a HTPC. You are always going to find positives and negatives about anything that you look at. 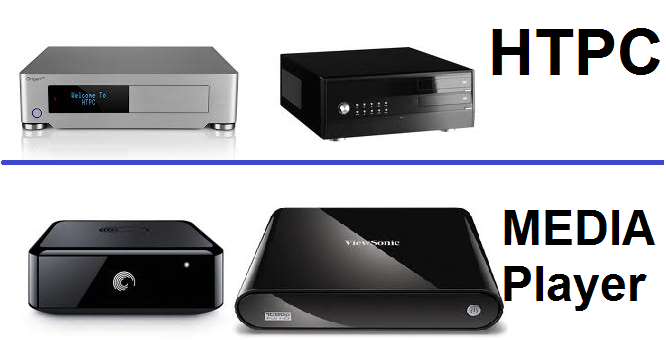 In order to make an informed decision about if you should purchase a media player or a HTPC. If you are struggling to determine what is best for you then you are going to need to consider carrying out some research. You will want to find specific products and then research all of them. The more information that you have the better off you are going to be when you have to make a decision.